Robson Ranch in Denton, Texas is a highly acclaimed active adult golf course community 35 miles northwest of Dallas and Fort Worth. The projected 7,200 homes will make it one of the largest adult communities in Texas complete with world-class amenities, a vibrant lifestyle, and superb homes. This gated community is primarily targeted towards residents age 55 and older. A portion of the community is reserved for residents who are age 40 and older. The lower age restriction and world-class amenities have attracted active adults who are looking for a great lifestyle, not just a home. Many of the residents come from the surrounding Dallas and Ft. Worth metroplex but more than half of the community's residents are from other states. Many out-of-state retirees are attracted to the warm climate and proximity to the recreational and cultural opportunities in the surrounding area. A large portion of the residents have moved to the community to be near their children and grandchildren who reside in and around Dallas. This community's proximity to Dallas means that a world of excitement is just a short drive away. But with everything the community has to offer, you might never feel the need to leave. The 17,500 square-foot Robson Ranch Clubhouse is a central hub for much of the community's social activities and events. The luxurious facility includes a 400-seat ballroom with a stage, multi-purpose rooms and a catering kitchen. The clubhouse plays host to a variety of fun activities including theatrical performances, guest speakers and dances. As the community continues to grow, more clubhouses are planned. The Pinnacle is a state-of-the-art fitness center that includes the latest cardiovascular and weight training equipment. The Pinnacle includes a large weight and cardio room, an indoor lap pool, whirlpool, saunas, and a full-service salon. An indoor gymnasium offers a full basketball court, which can also be used for pickleball and volleyball. Outside, there is a resort-style pool, children's pool, patio, as well as six lighted tennis courts and pickleball courts. The Robson Ranch Creative Arts and Technology Center hosts other great amenities such as a library, computer lab, arts and crafts studio, woodworking shop and ceramics studio with three kilns, perfect for expressing your creative side. Golf enthusiasts will cherish the 18-hole Wildhorse Golf Club at Robson Ranch Texas. It was designed by renowned Texas golf course architect Gary Stephenson. The 6,892-yard, par 72 course features multiple tee placements for men and women providing a fun and challenging round for golfers of all skill levels. The course features strategically placed bunkers, notable hazards and breathtaking landscaping that combine for an exciting round of golf. Future courses may be added as the community continues to grow. After a round of golf many residents enjoy gathering at the Robson Ranch Grill that serves many Texas favorites. The full-service restaurant, lounge. and sports bar is open seven days a week and is the ideal place to gather with friends for a casual lunch or an intimate place for a cozy dinner with your significant other. Additionally, a large courtyard and covered patio offer magnificent views of the golf course and surrounding community. Like all Robson communities, homebuyers can select from a great assortment of single-family and attached homes uniquely designed for the needs of active adults. At Robson Ranch in Denton there are over 25 different floor plans to choose from, including both new construction and resale homes. The models range in size from 1,404 to 3,746 square feet. Most homes feature two to four bedrooms, two to three-and-a-half bathrooms and a two to three-car garage. Many of the homes feature some of the latest sought after design trends such as expansive great rooms, open kitchens and ample outdoor living space. This community was started in 2002 and will be home to approximately 7,200 residences upon completion. Buyers can select from both new construction and pre-owned resale homes. The new construction homes offer the ability to semi-customize with the desired features and upgrades. These homes were built with the active adult in mind, incorporating open living concepts, inviting outdoor spaces, and energy-efficient appliances. Many retirees who flock to this community are attracted by the vibrant social scene that includes a wide assortment of activities, clubs, classes, and events. There are over 60 different clubs and organizations representing everything from cards and crafts to dancing and tennis. A health and fitness committee promotes activities and education by providing residents the opportunity to enhance their physical, mental, and emotional well-being. These include a wide range of activities from Tai Chi to water aerobics to softball. Every day, a new lineup of exciting activities await the residents this active adult community and there is sure to be something that appeals to all kinds of residents. These groups range from woodworkers to the dog club to the pottery club. Regularly held events include the singles mix and mingle, Wednesday dine out, and bible study. With such a vast neighborhood and residents committed to social engagement, this community will have a group or club that matches your interest. Robson Ranch is located in Denton, Texas just two miles west of Interstate 35. The surrounding area is full of attractions, dining options, and cultural events that are sure to keep calendars full throughout the year. Residents will be happy to know that the Denton Regional Medical Center and Presbyterian Hospital are both located nearby. Residents have many shopping opportunities with Sam’s Club, Wal-Mart, Albertson’s, Golden Triangle Mall and Denton Town Crossing all within eleven miles of the community. Those who love to travel will be happy to live close to the Denton Municipal Airport and Dallas-Fort Worth International Airport. 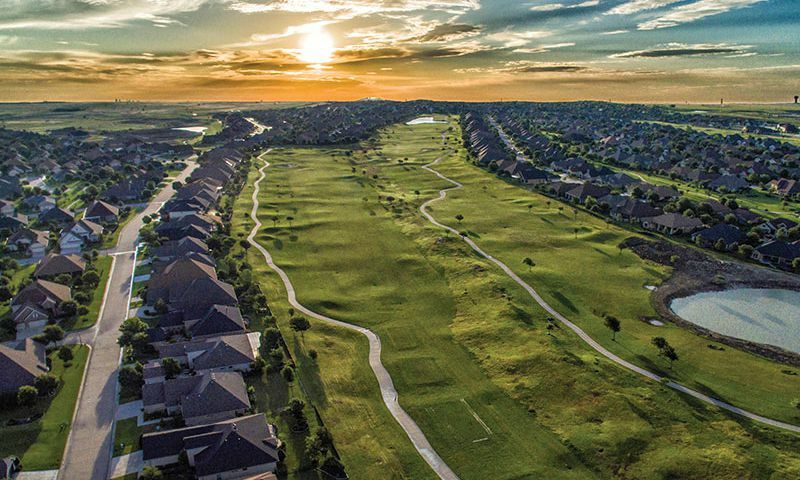 With low-maintenance homes, a premiere location, and carefree lifestyle it’s easy to see why Robson Ranch is a popular active adult community in North Texas. The Pinnacle is the hub of all activity for fitness, aquatics and outdoor activities. The Pinnacle Fitness Center - 9,500 Sq. Ft. The Creative Arts & Technology Center provides classes, club meetings and studio space for arts and technology pursuits. The Wildhorse Golf Club has everything you need for the perfect golf experience. There are plenty of activities available in Robson Ranch - Texas. Here is a sample of some of the clubs, activities and classes offered here. Robson Communities began developing attached homes in 2015 and are currently available as new construction. These homes range in size from 1,404 to 1,839 square feet and offer two bedrooms, two or two-and-a-half bathrooms, and an attached two-car garage. The Tradition Series offers thirteen floor plans that range in size from 1,284 to 2,781 square feet. Homes feature two to three bedrooms, two to two-and-a-half bathrooms and a two or two-and-a-half-car garage. Homes in the Premiere Series range in size from 1,826 to 3,198 square feet. Homes typically have two to four bedrooms, two to three-and-a-half bathrooms, and a two to three-car garage. Homes in the Estate Series range in size from 2,386 to 2,950 square feet. Homes feature two to three bedrooms, two to three-and-a-half bathrooms, and a two to three-car garage. Homes in the Encore Series range from 1,413 to 1,846 square feet. Homes feature two bedrooms, two to two-and-a-half bathrooms, and a two-car garage. This is an amazing community in such a beautiful setting. The home designs are some of the best I've ever seen and the clubhouse is incredible. There is so much to do and the people around here are all so nice! You would not be making a mistake to live here. Last Summer my fiancee and I retired; we both wanted to move to a house that we could call "our own", Having grown up in the DFW area, I know the Metroplex very well. Based on all the Dallas area congestion, we knew that we didn't want to live North or East of DFW AP. After looking in FTW, Granbury, Aledo, and all the smaller cities NW of the AP, we came to conclusion that there was nothing unique about any of those neighborhoods. Then we saw a TV commercial for RR; not thinking we would care for it, we reluctantly visited. Wow! The white fence, the beautiful manicured landscaping, models, clubhouse, library, restaurant, golf course, view, sports center, and homes were just stunning. But most of all, the friendliness and closeness of the homeowners was what really sold us. We bought within days; have not once regretted it. Simply put there is "no other place like it in the DFW area"; one on the Western border of Frisco, claims to be, but we know from visiting there, it's definitely "no Robson Ranch"! We recently purchased an existing home at Robson Ranch after exploring three different adult communities in the Dallas-Ft. Worth area. After plenty of analysis and comparison, we felt the most impressed with Robson Ranch. We were taken with the warm, gracious, and welcoming attitude of everyone we met, from the staff to members of the community. The facilities cannot be matched in other communities, particularly in the creative arts building and workout facilities. The golf course is very popular and playable for men and women. There just are no limits on what you can do here according to your interests. But the homes themselves really stand out. The floor plans are the best of the three, and for new construction, Robson is extremely helpful and accomodating. You can put a real individual stamp on a home, and they will work hard to accomodate your particular requests. Access to I 35 W is a cinch, and everything you need is within a 10 minute drive with easy traffic. Access to DFW airport is easy, as well as to top notch medical care, a university, and lots of cultural activities. Be sure to check out Robson Ranch in Denton Texas, the only Robson community outside of Arizona! RR is a great place to live. Facilities are wonderful and the people are very welcoming. Robson Ranch is great! We like that it offers all the things you'd find in a 55 and up community but you can live here at age 40. The crowd is younger and we like that. Everyone is very friendly and we love having so much to do. The community is very large but it still feels like a close-family atmosphere. 55places.com is not affiliated with the developer(s) or homeowners association of Robson Ranch - Texas. The information you submit is distributed to a 55places.com Partner Agent, who is a licensed real estate agent. The information regarding Robson Ranch - Texas has not been verified or approved by the developer or homeowners association. Please verify all information prior to purchasing. 55places.com is not responsible for any errors regarding the information displayed on this website.